YoYoExpert Blog & Yo-Yo News – New Duncan MayheM! 2/8 @ 8PM EST! Duncan is breathing some new life into one of their old school favorites. This is the new and improved MayheM! 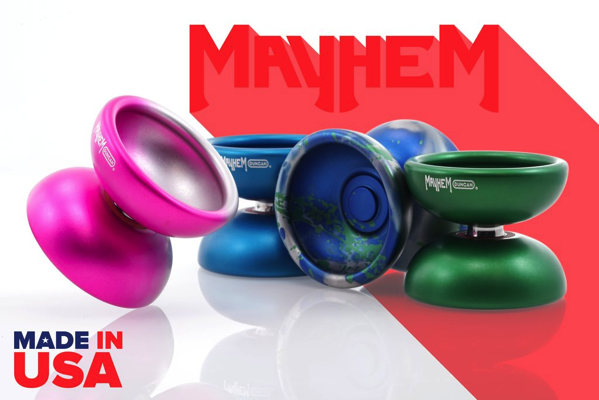 The MayheM was one of the first premium metal yo-yos in Duncan’s Screaming Eagle lineup. Originally modeled after the classic FHZ shape, Duncan gave the new MayheM a similar comfortable organic profile with an updated weight distribution for modern performance. It has a stable and powerful feel in play with a nice presence on the string that begs you to keep on throwing! FRIDAY 2/8 @ 8PM EST!